International Patents granted and pending. HASTEN-COTTON is a unique spray adjuvant that has been designed to improve the efficacy of a wide range of agricultural products including; and Fungicides. The Active Constituent in HASTEN-COTTON is derived from Cottonseed Oil.. When HASTEN is mixed with certain defoliant products and applied in the field, the non-ionic surfactants in the HASTEN formulation help to retain spray droplets and ensure thorough coverage of plant surfaces. The esterified oil in the HASTEN formulation will retard crystallization of water soluble defoliants as water evaporates from spray droplets. It will also increase the penetration of systemic defoliants through a plant’s epicuticular waxy surface leading to enhanced defoliation. It is this dual action of surfactant and esterified oil which makes HASTEN a very effective adjuvant with certain defoliation programs. HASTEN is suitable for use with various insecticides used in Cotton. HASTEN can used to increase the efficacy of systemic insecticides such as Synthetic Pyrethroid insecticides and Movento*. 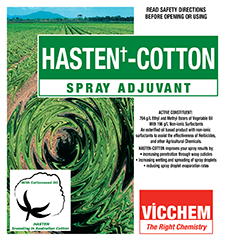 See Directions for Use on HASTEN-COTTON label and on the Insecticide product label. HASTEN is a non-ionic formulation which makes it compatible with most defoliants. In fact, HASTEN has been used with defoliants around the world and has been found to be physically compatible with major defoliant products. HASTEN has been tested and evaluated by universities, lifescience companies, research organizations and independent researchers over many years. It has been established that HASTEN is a very effective adjuvant for improving the performance of certain defoliation programs. HASTEN is successfully used by farmers in many different countries around the world with a diverse range of agricultural products including defoliants. In Australia and the USA, HASTEN is recognised as a leading adjuvant by farmers, distributors and lifescience companies. HASTEN may be used in place of non-ionic surfactants or crop oil concentrates when permitted by defoliant labels. When using DROPP® Ultra in Australia, use HASTEN at 0.5 Litres per hectare. We recommend that a compatibility test be conducted before using HASTEN with other defoliants on a large scale. When using with Movento* 240SC, apply HASTEN at 1.0L/ha. Typically, HASTEN is added to the spray tank at a concentration of 0.5-1.0% when spray volumes are between 50-100 Litres per hectare. In situations where the agricultural practice is to use a higher volume than 100 Litres per hectare, HASTEN is typically used at 0.5-1.0 Litres per hectare. 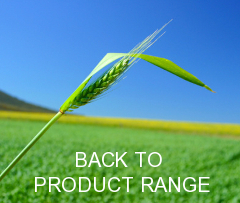 Extensive testing and evaluation of HASTEN over the past 14 years by universities, lifescience companies, research organizations and independent researchers has proven that HASTEN is a very effective adjuvant for improving the performance of agricultural products. Based on independent university studies, it is well established that esterified vegetable oil products out perform both emulsified petroleum and vegetable oil based products in many situations. HASTEN TM’S commercial success is confirmation that it can provide important cost effective benefits to the agricultural industry.